:: More merchandise for sale! 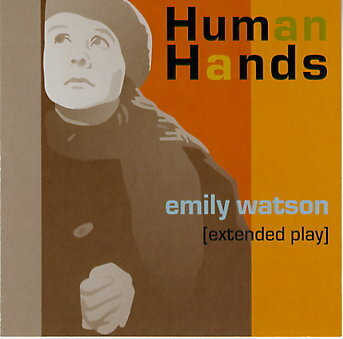 Human Hands return to the stage for the third time this year. Check the Schedule page for details about the shows, and sign up on the mailing list for info about the forthcoming recordings. Thirty years after the original band came together, Human Hands have finally recorded and released their official full-length debut album. The band line up has changed a bit since then, as has the musical approach, but the two main original songwriters, Dennis Duck and Juan Gomez, are still crafting the tunes. 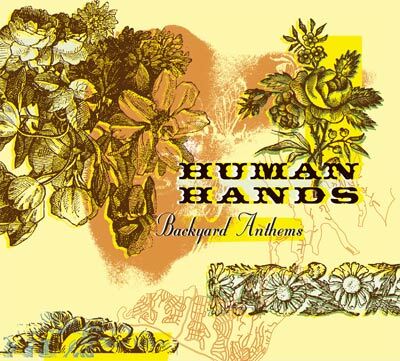 The new CD, “Backyard Anthems,” boasts 10 cuts, nine of which are brand-new songs, plus one vintage Human Hands song, “Happy Ending,” a staple of the current live set. The band’s sound these days is more straight-ahead power-pop than it was back in the early punk days, and these songs reflect a slightly psychedelic sensibility. For a preview, visit www.myspace.com/humanhands. Only $10 + $2 shipping in the U.S.
Limited edition, hand-numbered, four-song EP. Includes Emily Watson, Steam, My Beautiful Song and Shimmer. Even by L.A. standards, Human Hands has a checkered past. Formed in 1978, disbanded by 1981, the band still somehow managed to record enough material to fill several different versions of a compilation album. When it re-formed in 1999 with a drastically different lineup, the eventual result was this fine four-song EP, on which the band plays quirky, jagged, and jangly guitar rock that harks back (in a good way) to the time period and the scene that spawned Human Hands in the first place. The title track opens things up on an enjoyably skewed note: imagine the Beach Boys fronted by Morrissey, singing pretty background harmonies over chiming guitars while the singer croons about three different versions of a very unhappy girl (one a roughneck's widow who has now become a prostitute, another who's bound to a wheelchair, and another whose husband is "acting very peculiar"). "Steam" harks back even more explicitly to early-'80s post-punk guitar pop, while "My Beautiful Song" is harder and spikier around the edges. "Shimmer" evokes middle-period R.E.M., which is a compliment.